Alberto here, your intrepid (albeit tardy) on the scene BlogPaws reporter. 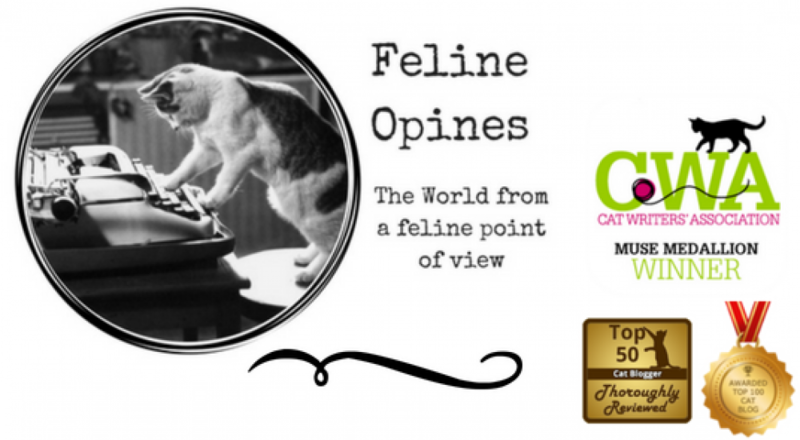 So the female human attended a conference for professional pet bloggers and writers and not only did she have a great time, she managed to connect with some of the best cat writers there. And these wonderful humans graciously donated signed books for her to use at her table at our local Panhandle Animal Shelter fundraiser in August. I’m going to feature each one of these talented (and generous authors) and their books. Today’s featured author is Deborah Barnes. Deborah Barnes is an award winning author and all around great cat lady. Her book “Makin ‘ Biscuits” was a multi award winner this year, receiving a Muse Award, The Good News for Pets Human Animal Bond Award and the CWA (Cat Writer’s President’s Award. This book is a delightful look at “Weird Cat Habits and Even Weirder Habits of The Humans Who Love Them”. It’s a compilation that personal anecdotes from Deborah and cat lovers around the world. If you want a “me too” moment or want to know a little more about felines and the crazy people who love them, you will love this book. As if this award-winning signed book wasn’t enough of a generous donation, Deborah donated two other signed copies of her books, , Purr Prints of the Heart and The Chronicles of Zee and Zoey. Purr Prints of the Heart is a memoir written from the viewpoint of a feline named Mr. Jazz. Mr. Jazz reflects on his life from kitten to old age and offers comfort to all who have dealt with the loss of a beloved pet. The third generous donation from Deborah Barnes is her book, The Chronicles of Zee & Zoey, A Journey of the Extraordinarily Ordinary. This book tells a beautiful tale of how two cats bond together and how they fulfill and enrich the life of their human. Through her willingness to be transparent and to share how some of her biggest hurdles in life were made easier through the love and relationship she enjoyed with these two marvelous felines. Not only is Deborah Barnes an excellent author, she’s a very nice human and the female human enjoyed getting to know her at BlogPaws. I urge you to hightail it to your favorite book seller and buy these books and, if you are lucky enough to live in Sandpoint, Idaho, you can attend the Hodgepodge at the Lodge fund raiser for the Panhandle Animal Shelter and bid on the table the female human is putting together which will not only have amazing books (I’ll be highlighting all the authors who graciously donated signed books in the next few blog posts) but will feature many other fun things for the feline library theme. Your BlogPaws on the scene reporter Alberto, signing off for now.